Crankshaft pulley holding tool (K10B) – No.KM-6347. Crankshaft pulley holding tool handle (K10B) – No.KM-956-1. Crankshaft pulley holding tool (K12B) – No.KM-6047. Crankshaft pulley puller (K10B) – No.KM-161-B. Crankshaft pulley puller (K12B) – No.KM-210-3. Crankshaft pulley puller adapter (K10B/K12B) – No.EN-49150. Ensure crankshaft keyway aligned with cylinder block notch  . Remove tensioner rail and chain guide. 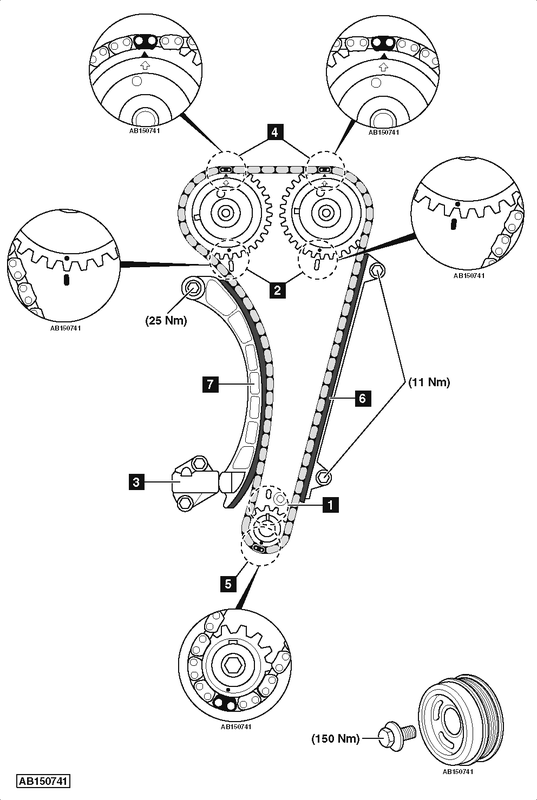 Remove timing chain and crankshaft sprocket as an assembly. Align coloured chain links with timing mark on each camshaft sprocket  . Install new chain guide  . Tightening torque: 11 Nm. Install new tensioner rail  . Tightening torque: 25 Nm. Ensure coloured chain links aligned with timing mark on each sprocket  &  . Install new tensioner assembly  . Tightening torque: 11 Nm.